Did a head of state order TB Joshua’s anointed water as a cure for Ebola? TB Joshua’s Synagogue Church of All Nations (SCOAN) have released two videos clearly making the incredible claim that the request for the anointed water sent to Sierra Leone came direct from the president, Dr Ernest Bai Koroma. In the latest video, it is TB Joshua himself making the claim. Both these statements are in the video below. Interestingly, the president’s public website acknowledges TB Joshua’s donation of $50,000 but says nothing about the donation of anointed water. Now the mainstream press are picking up on the story, but the important question that remains unanswered is: Did the President of Sierra Leone Dr Ernest Bai Koroma really personally request water as a cure for the Ebola outbreak in his country? It is time for the Sierra Leone government to come clean on this and release a formal statement. We’ve got to admit, it took us by surprise. A country actually took TB Joshua up on his offer of a donation of anointed water to fight the Ebola virus. Joe Fayia Nyuma, representing the Sierra Leone High Commission to Nigeria claims that the request for anointed water came straight from the president Dr Ernest Bai Koroma himself. In the video below, it claims TB Joshua sent $50,000 donation, 4000 bottles of anointed water on a chartered jet, costing an additional $50,000. Nyuma claims that the anointed water will be used to “curb the deadly Ebola yoke that is about to destroy our nation”. While we at TB Joshua Watch fully believe in the healing power of God, we do not believe that he operates like a vending machine, dispensing healing at the puff of a spray. The anointed water is completely unbiblical and idolatrous, and in a case like this will only hamper the efforts of brave health workers battling this disease. The World Health Organization reports that so far 170 health workers have contracted the virus and 80 have died. Meanwhile, TB Joshua uses the crisis to promote his anointed water and brag about how much money he spent on a private jet. We hope it is only a matter of time before the Nigerian government takes decisive action against this dangerous con artist. The full video is below, the statement from Joe Fayia Nyuma starts at 6:10. Is TB Joshua’s anointed water the solution to the Ebola crisis? On the 2nd August 2014, TB Joshua announces to his congregation that he had just finished a meeting with a large delegations of officials from the government and NGO’s such as UNICEF discussing various issues, including the Ebola crisis. The delegation formally handed him a letter, the contents of which he didn’t disclose. The way he described this meeting led his delighted flock to believe that the officials had come to seek the counsel of their “man of God”. Though the contents of the official letter was never disclosed, it seems very likely that it announced the tough measures being taken against any faith healers claiming to be able to heal Ebola. The Washington post have reported that any pastor or healer claiming to be able to heal the virus will face jail time. He next goes on to say that when the new anointed water came out, he didn’t allow it to be sent everywhere because God had revealed the coming Ebola crisis to him. He says he will donate 2000 bottles of the anointed water to each of the affected countries and if invited by the government, he will even deliver it personally and spray it everywhere. The clear message behind his statement is that his anointed water is the solution to the Ebola crisis. We hope the Nigerian government will follow through and take the necessary action to prevent the ego of this fake pastor from exacerbating this deadly crisis. The segment starts from around 1:50 in the following video. Only months since several people lost their lives in a futile attempt to get their hands on TB Joshua’s anointed water at SCOAN Ghana, TB Joshua is sending his water to London for a special anointed water service, the Christian Post reports. This anointed water is the third version of the product (and we use the word “product” deliberately, SCOAN’s claims that it is not “sold” are extremely dubious). 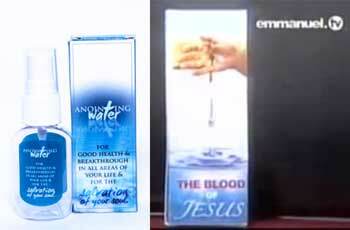 The previous version of the anointed water was blasphemously labeled “for the salvation of your soul“, the third version took the blasphemy to new heights by calling it “the blood of Jesus“. The most incredible thing is, since the release of Anointed Water 3.0, TB Joshua actually admitted that it is pointless (at least if you followed his statement to its logical conclusion). Apparently TB Joshua is just providing you with water (and not even enough to drink), the anointing is from God. Therefore, unless TB Joshua has a monopoly on God, you’re getting nothing more than what you could get from your tap. For the poor Ghanians who went looking for breakthrough from this water, it proved worse than pointless, it was deadly. Four lost their lives (the “anointing” in the water didn’t help them with that), and many were injured (why didn’t the “anointing” in the water protect them, or at the very least heal them?). People of London, you have very easy access to water. If you believe God is going to use water as a means to your blessing, then get it from the nearest tap, don’t waste your time, energy, hope and money waiting for these little packets of water. What about all the people the anointed water works for? As several readers have pointed out, TB Joshua has added a prayer stool to his profitable line of indulgences. For an as yet undisclosed price you too can have a rickety, badly manufactured stool what TB Joshua describes as “a bit of heaven on earth” in your own home! Thanks TB Joshua for your continued exploitation of desperate people. We await the first people appearing in the SCOAN prayerline for prayer stool related injuries. In our last few posts we have focused on TB Joshua’s anointed water, particularly since the tragic death of 4 people in Ghana desperately trying to get these little packets of water. A point raised several times in the comments is if the anointed water is fake, how is it so effective on hundreds of people? In this post we will consider 3 possible reasons for this apparent disparity. That the anointed water is over-hyped is a fact, one that sadly left 4 people dead. When people claim the incredible potency of the anointed water, you should first ask what their source is? Most likely Emmanuel TV. In that case we know they systematically engage in deception in their portrayal of both prophecies and healing. How can a few minutes on Emmanuel TV be proof that this water causes marriages to be restored, or people to be delivered from psychological conditions? What state are these people in now? It is well known that the brain has a hugely important role in a persons physical health. Researchers routinely take advantage of this by using placebos, inert drugs or procedures that the patient believes will make them better. It is well known that this belief that something will make you better is in fact surprisingly effective, even with physical ailments. People who take the anointed water have a huge amount of faith that it will work for them (again, hence the deaths) – therefore it is almost certain that the placebo effect plays a role. Maybe in some cases people really are healed or “delivered” through the administration of this water. Does this bring our assertions tumbling down? No, because the bible is clear that it is not only genuine Christian ministers who can do signs and wonders. Most notably the false prophets and messiahs prophecied by Jesus in Matthew 24:24 do “great signs and wonders”. You could also consider Pharaoh’s wise men and sorcerers who performed very impressive signs and wonders in Exodus 7. If you assume TB Joshua is real and the anointed water is of God on the basis of what you perceive to be genuine miracles, then presumably you would also accept that Reiki healers are of God? Or new age healers? Or spiritual healers? Or Traditional healers? All of these, as with TB Joshua, have followers who claim to have been genuinely healed by them. It is abundantly clear from scripture that the appearance of a miraculous sign is not enough to validate a ministry. You have to look beyond the surface, and this is where the picture becomes very clear with the anointed water. Not only is the anointed water blasphemously called a means of salvation (version 2.0) or even worse “The blood of Jesus” (version 3.0), it sets up TB Joshua as a false christ by leading people to believe that he holds the key (a little packet of water) to their healing, deliverance or even salvation. It appears that even TB Joshua knows this since he recently declared that the only part he played in the process was providing the water, which begs the question why get the water from him? In conclusion, regardless of whether the apparent effectiveness of the anointed water is hype, the placebo effect or real (almost certainly there are cases of all three) the teaching around it leaves us with no doubt that it is unbiblical, unchristian and ultimately damaging to those who put their hope in it.